Airport Parking offers a wide range of options for parking at Dublin Airport. With both on and off-airport options, there will be something on offer to suit every need and budget. So as well as being a more convenient option, it may also be easier on your finances. To view the hotels on offer at Dublin Airport and get a quote please click here. 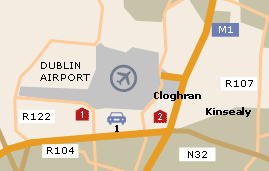 From Dublin city centre, take the M50 northbound and exit onto the M1 northbound; the airport is signposted. Road: Taxi: Taxis are available from outside the terminal. Bus: Frequent local bus services, operated by Dublin Bus, leave from the main Arrivals road directly outside the terminal. These include the Airlink express bus, which runs to Dublin's main bus and rail stations. Bus no.747 runs to the O'Connell Street, the central bus station and Parnell Square West. Bus no.748 runs to Heuston and Connolly rail stations and the central bus station. Other bus services operating from the airport include the 24-hour Aircoach service to south Dublin (including most major hotels in the city), and the AerDart shuttle service to Howth Junction DART station. Coach: Coach services operate from the airport's coach park on the far side of the main car park building to many destinations in Ireland. The Airport Information Desk and the Dublin Tourism information and reservation centre are both located on the Arrivals concourse. Money and communications: Bureaux de change and ATMs are located throughout the terminal. A foreign exchange currency dispenser is located on the Departures level. There is a bank on the Departures concourse and a post office in the car park atrium. Eating and drinking: The airport has a variety of restaurants, cafes and bars. Luggage: A left-luggage facility is available in the atrium of the multi-storey car park. Other facilities: There is a pharmacy and a free nursery; baby change facilities are available in most airport toilets. Facilities include adapted toilets, lifts with Braille buttons and an induction loop. Passengers should inform their airline of any special needs on arrival at the airport or when making their booking. A Minicom telephone is provided for hearing-impaired travellers. Short- and long-term parking for disabled passengers is available and can be booked in advance. Greencaps can provide wheelchair services for a small fee. Need to book airport hotels? Visit Airporthotels4less to book at discounted prices.